Blouse is commonly found in every Indian woman’s wardrobe as an everyday attire or for special occasions. It is an upper garment which is mostly paired with a saree or lehenga. Blouses come in a variety of designs and patterns. Keeping pace with the changing fashion trends, blouses are available in numerous designs such as high-neck blouse, halter blouse, boat-neck blouse, and more. Apart from regular stores, blouses are also a frequently purchased garment online. There are many fashion brands that are selling exquisite designer blouses online. 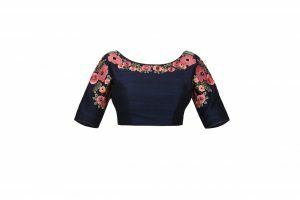 One such online brand is TheHLabel.com that offers the best designs for garments crafted using top quality fabrics at affordable costs. It sells a wide range of designer garments suitable for every occasion. As you browse through the ethnic wear section, a notable collection you’ll come across is the “Mughal-Ae-Azhar” which is inspired by Indian floral paintings. The collection takes its inspiration from the alluring swirls and twirls of the Indian floral paintings. The garments typically possess the art of Mughal miniature floral painting elements like butterflies, peacocks, etc. The collection is a combination of ethnic and fusion wear with sarees, blouses, anarkalis, dupattas and fusion wear. Fabrics such as viscose silk, raw silk, Sanganeri print, Kora Chanderi, net and natural crepe are used. Let’s look at some of the blouses in this collection. Here’s a royal blue embroidered blouse crafted from raw silk. Team the blouse with a pastel colour georgette saree. Put on traditional earrings to complete the look. Put on this pink blouse decorated with delicate embroidery on the neckline, back and sleeves. The blouse is cut from fine raw silk and can be teamed with a contrastingly coloured saree. Wear statement neckpiece along with the ensemble to look great at a party. Designer saree blouses in vibrant colours, designs and patterns are available at TheHLabel.com. Visit the website and just browse through the collection. Looking for a blouse that’s simple yet stylish? Check out this beige blouse from the collection. The blouse is cut from raw silk and is best to match with a pastel saree. The Peter Pan collar and the embroidery on one side is the main highlight. Carry a smart clutch to complete the look. Don’t miss this lovely olive green blouse. The blouse is cut from raw silk and has elegant embroidery on the neckline. Drape a contrastingly coloured saree over the blouse. A pair of heavy earrings with light shimmer makeup will definitely add to the look. Make a style statement by donning this beige blouse. The blouse has flower motifs embroidered on either sides of the shoulder and back. The raw silk adds to the rich look of the blouse. Drape a printed georgette saree and matching pearl drop earrings for an elegant look. The ethnic wear at TheHLabel is a must-have in every woman’s wardrobe. So this season, create your very own signature style with TheHLabel.com.